ICLR have added a new Knowledge section to their website, alongside their case law platform ICLR.3 and the long-established Weekly Notes blog. 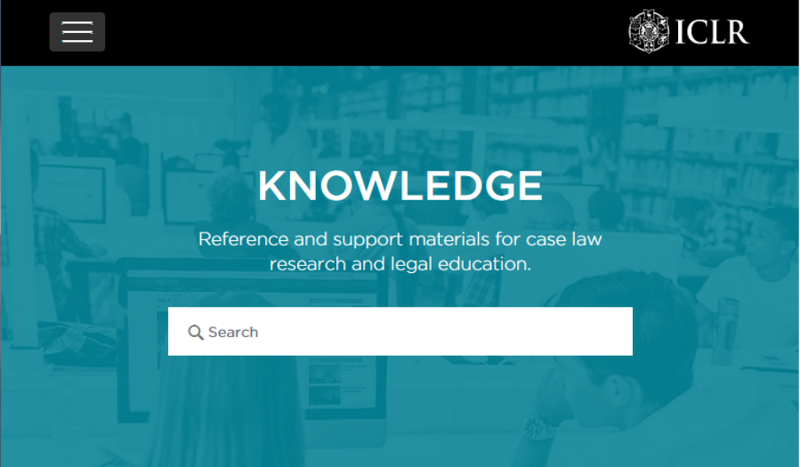 Launched in late 2018, the Knowledge section is aimed at both students and practitioners, or even interested members of the public, with articles about the legal system and law reporting. The content, which is being added to regularly, is arranged under Case Law, Legislation, Topics, Guides, FAQs and a Glossary of legal terms and concepts. Whether your question is about how secondary legislation is made, what is the difference between a law report and a judgment transcript, or the meaning of the Latin maxim “Nemo debet bis vexari”, the ICLR Knowledge base has the answer. You can also find the Anatomy of a Law Report, an explanation of the different words used (“affirmed”, “approved”, “reversed”, “doubted” etc) to describe how a later decision can affect the status of an earlier precedent, and a guide to using the ICLR.3 platform to search and explore cases going back to 1865 along with current legislation and commentary. This is a terrific resource for all those learning the law or just curious.